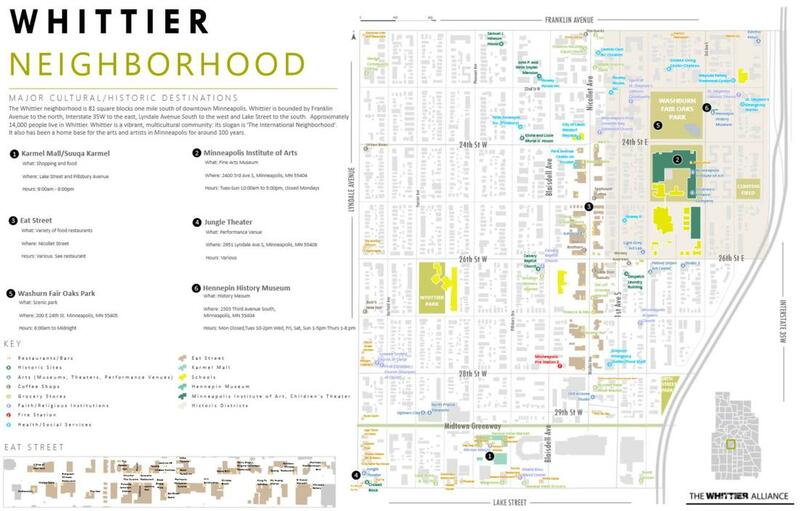 The Whittier Alliance, in conjunction with the Center for Urban and Regional Affairs (www.cura.umn.edu/) and the Urban Studies department of the University of Minnesota, created these maps to show various sides of our neighborhood. Special Thanks to our interns; Hope (Xizi) Tong, Michael Mueller, Ethan Van Offelen, Inyoung Hur, Olivia Mackert, Fartun Dirie, Samuel Jones, Keaton Danielson and Luke Odenthal, Jeff Matson and Malik Shabazz of CURA, Whittier staff Bo Whitesman and U of M Professors Paula Pentel and Ying Song. For a look at how we created this project, review the documents on the Guiding Documents page or follow the Guidance button below. Final Thanks to Michael Mueller and Anne Lehman for making the webpages.